Have you struggled with houseplants in the past? That expensive palm tree for your living room turns yellow and brown no matter how well you try to take care of it? No matter what you do or how hard you work, your African violets wilt, your peace lilies droop from thirst, and everything in between fades away in a matter of week or months? Has it gotten so bad that even your plastic ficus will drop leaves when you’re in the room? Let’s face it; not everyone can claim to have a green thumb. Don’t give up yet! When all else fails, give Sansevieria a shot. Sansevieria, also known as snake plant and mother-in-law’s tongue, has earned a reputation for being nearly indestructible. They come in many shapes and sizes and make great plants for the corner of a room, on tabletops, and in outdoor living spaces. Despite their virtual indestructibility, there are a few things you’ll need to know to aid in your success. If there is one weakness that can doom your success with Sansevieria, it is overwatering. Most houseplants enjoy a period of drying out between waterings, and Sansevieria is no exception. In fact, unlike many varieties of houseplants, these guys can tolerate a few periods of drought when you forget to water for a few days. Or a week. We know who you are! However, too much watering can cause a disease known as basal rot, which causes rotted base roots and yellowing leaves that slowly die back over time. I recommend watering once or twice a week, depending on how dry your home is. In the winter months, I recommend a watering of only one to two times per month. Also, it’s best to water the soil around the edges of the leaf stalks while avoiding wetting the heart of the plant, where it can get trapped and cause rotting problems. Light is an easy one! Sansevieria can handle any lighting conditions. While you’ll ideally want to place it in a brightly lit room without direct sunlight, it can thrive in bouts of direct sunlight or even a deeply shaded room if that all you have available. Sansevieria thrives in temperatures above 50 degrees. It also requires very little humidity, so occasionally misting the air is not required. If you keep your Sansevieria outdoors on a screened in patio or outdoor living space, be mindful of falling temperatures in the fall and early spring. Any temperatures below 50 degrees will damage the foliage, so be sure to move yours indoors when temperatures begin to fall. It is seldom required to repot Sansevieria. Potting is probably only necessary when the plant’s roots do damage to your existing pot. When you do put it in a new container, make sure to use a loose, well-draining soil. Rich soils will hold more moisture which you do not want with most houseplants. 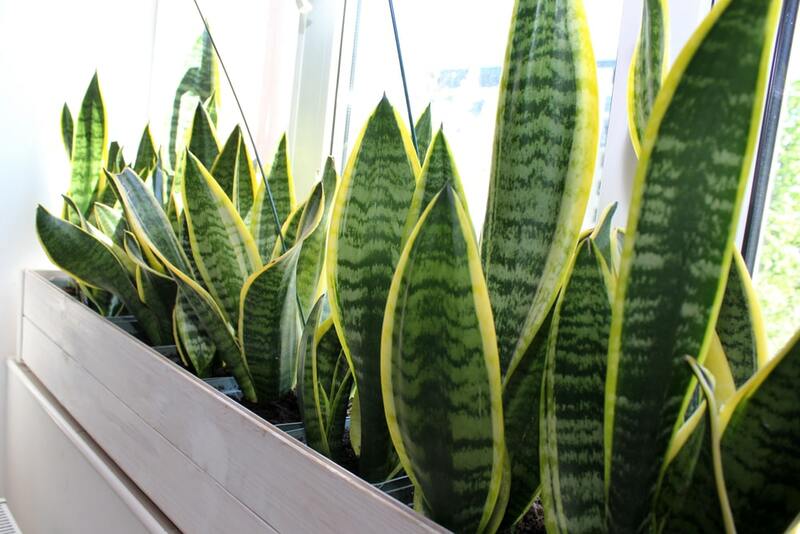 The sword-like leaves of Sansevieria are a focal point, but with a little maintenance can shine. Run a cloth across the blades to remove any dust that may have collected, and then spray and wipe down with a foliage shiner for best results. Also, if you maintain Sansevieria in ideal conditions, occasionally your plant may spray off a few small, fragrant white flowers. Overall, Sansevieria is the answer to anyone who has struggled with indoor plants in the past but doesn’t want to resort to expensive, artificial plants to add a bit of nature to their interior design. For those with a brown thumb, or for new gardeners looking to get their feet wet with a plant that can offer a high return on your investment with very little upkeep, Sansevieria is right houseplant for you. You did not mention feeding. I have several plants and have not feed them ever. ?? Your thoughts on feeding. Sansevieria doesn’t require much fertilization at all. Maybe apply an all-purpose general fertilizer in the warmer months to help give it a little extra nutrition, but don’t go overboard. I wouldn’t fertilize at all during the fall or winter seasons. I want to warn about the Sansevieria plant around cats. If cats chew on them it will make their mouths/tongues swell up. I did not know this when I had a litter of five kittens running free in my house. All of them chewed on my snake plant. It was not fatal to them, but until their mouths returned to normal (day or two), they might have thought they were dying. Most likely, the plant will affect any mouth like this. The plant is a wonderful plant, just be responsible with it. Here’s a bit of plant trivia, the famous Olduvai Gorge where Louis Leakey found so many early hominid fossils is named for the wild Sansevieria found there – Oldupai means “the place of the wild sisal” (Sansevieria), in Maasai. Deborah, Weather in the Garden is on Saturday, March 23, this year! Can’t wait. It’s so much fun.